Tears have fallen from the face of Ted Kotcheff on to the Bulgarian ground from which his roots sprang, in Plovdiv, once home to his father. It was an emotional part of Kotcheff’s journey to Bulgaria, from which he returns to Canada with valued keepsakes – a certificate of Bulgarian citizenship, and an official identity card that states that he has an address in Plovdiv. Born in Toronto in 1931, Kotcheff – best known, perhaps, among all his credits on IMDB for having been the director of Rambo: First Blood – is the son of a Tschotchev. The “Ts” was substituted by a “K” by a Canadian immigration official. Kotcheff came to Bulgaria for the Sofia Film Festival, to showings and presentations in Sofia and in Plovdiv. In the Bulgarian capital, the documentation that he had lodged earlier bore fruit as he was personally presented with a certificate of Bulgarian citizenship by Justice Minister Ekaterina Zaharieva. The Justice Ministry media statement confirming the fact solemnly recorded that officials had checked the validity of the documents that he had presented. “Experts from the Bulgarian Citizenship directorate carried out a thorough examination of the documents submitted by Kotcheff and records at the Ministry of Justice under Article 38 of the Bulgarian Citizenship Act. The examination found that the director is a Bulgarian citizen by birth and this circumstance is documented by a certificate of Article 39, Paragraph 1 of the Bulgarian Citizenship Act,” as the official prose of the ministry put it. In Kotcheff’s own memory and self-identity, however, is a feeling of being Bulgarian. Local media recorded with enthusiasm his words on various occasions during his journey: “Bulgaria is in my heart. You will always be in my soul. I am Bulgarian. My Dad was born and raised in Plovdiv”. Kotcheff’s name at birth was Velichko Todoroff Tsotcheff. His mother was from Vambel, today in Greece and known as Moschochori, but she grew up in Bulgaria’s largest Black Sea city, Varna. 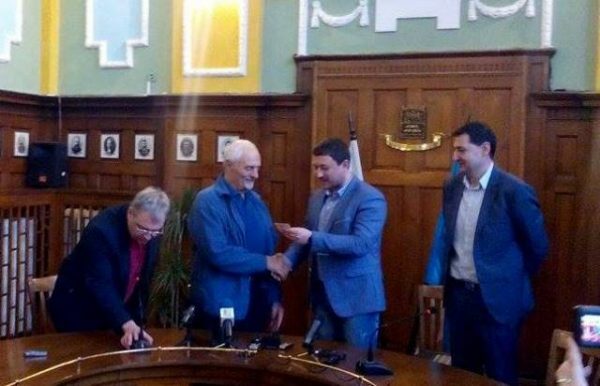 In Bulgaria’s second city, at a ceremony presided over by mayor Ivan Totev, Kotcheff was handed his identity card by Plovdiv chief of police Senior Commissioner Hristo Razsolkov. 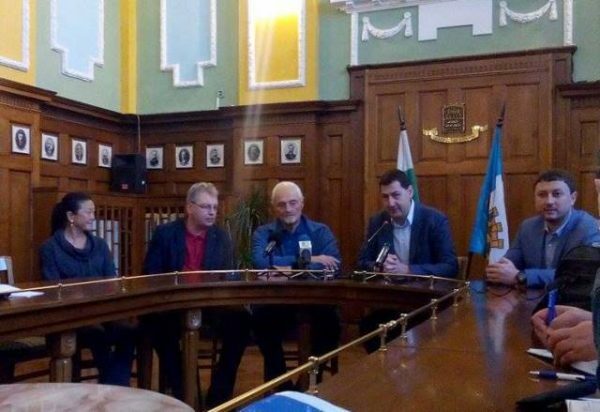 Kotcheff, according to Plovdiv media, warmly thanked the institutions that had so quickly responded to his desire to become a Bulgarian citizen. “Thank you, Ivan. Can I call you that?” he said to the mayor. “Of course, Ted,” replied Totev. “You are glorifying Bulgaria and Plovdiv in particular”. Totev handed Kotcheff gifts of two t-shirts, one black and one white, embossed with the logo of Plovdiv European Capital of Culture 2019’s logo, “Together”. Kotcheff said that his father had often spoken about Plovdiv, a city that the film director first visited in 1962. He added his recollection of the traditional cuisine that his mother had often put on the table – dishes involving lentils, beans, sausages, among others. He made a sentimental journey-within-a-journey to what was reported to be his father’s former home, in Plovdiv’s Dragan Manchev Street, weeping as he stood at the gate, regretting that circumstances did not permit him to go in. His identity card records a different address in Plovdiv, where relatives live. But matters took an odd turn on March 25, after his visit to the Dragan Manchev Street house, when reports said that Kotcheff had been directed to the wrong house, the result of an error by Plovdiv municipal clerks. There had been no one to answer the door because at the time he was there, the couple who have the house was at work. Kotcheff was feted elsewhere during his visit, being handed an award by Culture Minister Vezdhi Rashidov and being received by Sofia mayor Yordanka Fandukova. While in the country, he also spoke of a project that he has been trying to achieve in Hollywood for 40 years – a full-scale film production to tell the story of how, in 1943, Bulgaria prevented the deportation of Bulgarian Jews to the death camps of the Holocaust where more than six million Jews were murdered. In Bulgaria, he has discussed the project with Simeon Saxe-Coburg, son of the monarch of the time, Boris III, as well as other members of Saxe-Coburg’s family. Kotcheff said that, after several versions and drafts, he had a script almost ready. Now it was a matter of looking for funding. As a Canadian, he is eligible for subsidies, but now he has one more asset – the very Bulgarian citizenship that, given that the country is a member of the European Union, makes him eligible to apply for EU funds.